Ego, ambition, lust, and madness swirl into a raging whirlwind of betrayal and death in this grim tragedy. The plot is so bleak that it fell out of favor for 150 years, and modern scholars are deeply divided over what, if anything, is the point of it all. I’m not sure what possessed Shakespeare to transform a legendary story with a relatively happy ending into this grimdark play, but he did so with his typical flair and devastating result. The Bantam edition that I read had a decent variety of supplemental material. There is a running glossary at the bottom of each page providing definitions of archaic words and difficult phrases. 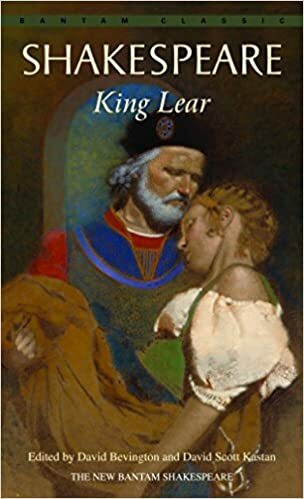 A couple essays and an annotated bibliography explored possible interpretations of the play, and several sections at the end provided excerpts from older writings that probably served as Shakespeare’s sources. There are significant difference between quarto versions and the folio version, and, like many editions, this one smooshes them all together so as not to lose any lines written by the Bard (the text-critical apparatus is inconveniently located all in one place rather than footnoted in the text where variants occur). Overall, an okay edition of one of Shakespeare’s bleakest plays.